It was my privilege, as it has been in the past, to work with my good friend Dr. George Boudreau, director of Public History of LaSalle University, for the past two weeks. George conducted a National Endowment for the Humanities sponsored seminar, entitled Teaching Franklin. 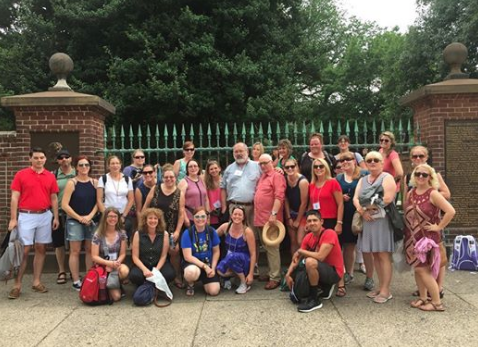 Two separate groups of teachers from around the country participated for one week each in an intensive program of lectures, historic site visits and archival exposure. Academic programs ranging from exploration of women in eighteenth century life; material culture such as how clothing was used to make political statements; slavery in the life of Benjamin Franklin and America; the United States Constitutional Convention; and a wonderful lecture on George Goodwin’s book, Benjamin Franklin in London were presented. George Boudreau gave his moving re-creation of Ben Franklin’s funeral procession, and Ed Mauger, premier tour guide of Philadelphia, gave wonderful tours. The two groups of forty teachers were an amazing group of educators, and gave me great hope for the way history is presented to the students of today. I formed many terrific connections with these people.